Photograph of a band of narrative sculpture on a column in the Virupaksha Temple at Pattadakal, taken by Henry Cousens in the 1880s. Together with Badami and Aihole, Paddatakal was one of the capitals of the Early Chalukya rulers, a powerful dynasty which ruled the Deccan from the 6th century. The site was used for the coronation ceremonies of its rulers. The temples at this site are grouped together and face the east. The Virupaksha Temple was built around 745 under the Early Chalukya dynasty to commemorate their victory over the Pallavas at Kanchipuram. The complex is situated in a large courtyard entered through a gateway and consists of a Nandi pavilion, a porch, a great pillared hall that precede the sanctuary where is the Shiva lingam. The roof consists of a multi-storey tower. The columns of the interior are decorated with bands of narrative friezes carved in high-relief depicting scenes from the epics of the Ramayana and the Mahabharata, scrollwork and lotus medallions. 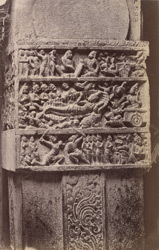 The column in this view depict battles scenes from the Mahabharata; the figure carved in the middle band is Bhima lying on his bed of arrows.